Marketing Programs, Inc. is a leading teleconsulting, loan production company that markets home equity lines of credit and small business credit lines and loans for national and super-regional banks. The Company has developed a unique marketing system for generating and closing consumer and business lines of credit. Over the past 20 years, MPI has been successful in generating billions of dollars in commitments for its bank clients. 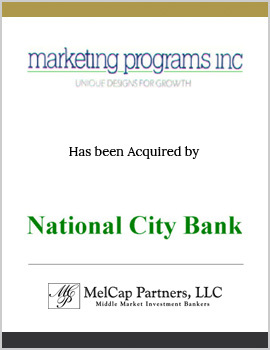 MelCap Partners acted as the sell-side advisor to Marketing Programs Inc.
Marketing Programs, Inc. was sold to National City Bank.